On the go energy bites are one of my favourite snacks! They're a perfect alternative to store bought energy bars that are at often times, a little overpriced. Recreating your own version of those energy bars is extremely simple so don't be intimidated! Plus, they can last a long time in your fridge or freezer! Try keeping for them snacks, for entertaining guests, or decorating smoothie bowls in the AM! Step 1: Blend dates in food processor for ~3 minutes until you reach the consistency of a single ball of dough. Remove blended dates and place in your mixing bowl. Step 2: Blend peanuts for ~2 minutes or until you reach a grainy consistency. If you blend for too long, your peanuts will start to reach a peanut butter consistency, and become too oily to form energy bites. Empty peanut grains into your mixing bowl. 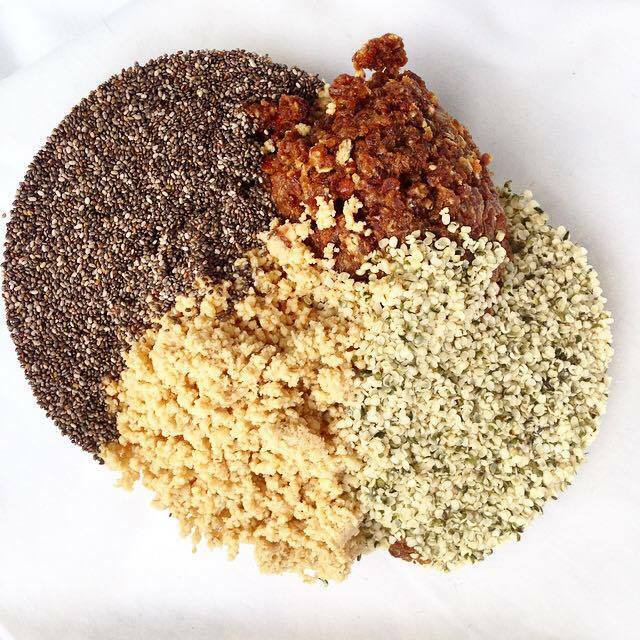 Step 3: Pour chia seeds and hemp hearts into your mixing bowl, and with your hands, mix ingredients together evenly. Now pour in your agave nectar, again mixing evenly. Step 4: Lay your parchment/wax paper down over your baking sheet. Roll your energy bites into balls, ~ 1 inch in diameter. Your mixture should create ~38 bite size balls. Because we are working with agave and dates, you may need to wash your hands halfway through your mixture, as it can get fairly sticky! Step 5: Fill each of your 4 small bowls with coconut, cocoa, matcha, and chocolate. Start by coating your coconut, cocoa, and matcha energy bites, and set on your baking sheet. In order to heat your chocolate, you can either microwave for 30 second increments for ~1.5 minutes, or you can melt in a small pot on your stove top on low for ~ 3 minutes. Coat your remaining energy bites, and place on your sheet. Step 6: Place your energy bites in the fridge for ~30 minutes to allow the balls to harden slightly, and for the chocolate to settle. Energy bites can be stored in an air tight container in the fridge for a few weeks, or in the freezer for long term storage.